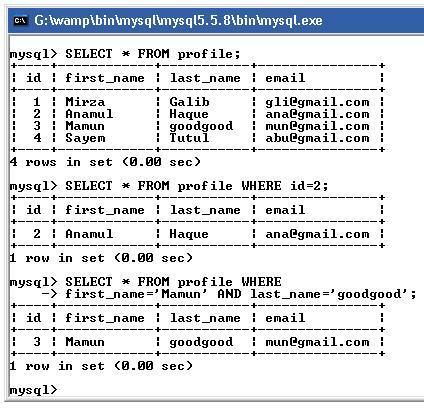 This section helps you to get familiar with basic MySQL including managing MySQL database and manipulating data using various SQL statements such as INSERT, DELETE, UPDATE and SELECT. 2. Type c: or d: on command prompt. This will be based on your WAMP server installations. 3. 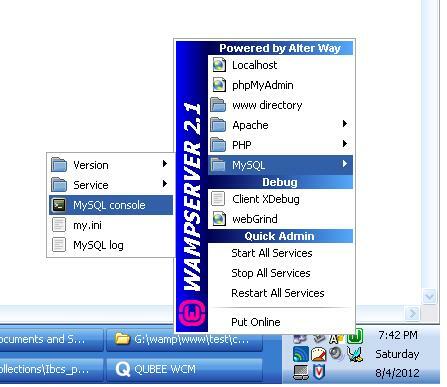 Assuming you have installed wamp on D: drive. We need a database, and in order to create a database you need to use the following syntax. 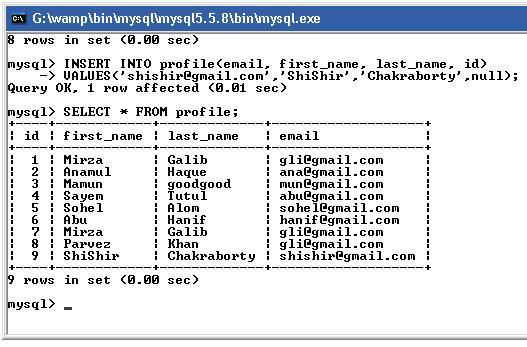 After executing the statement, MySQL will returns you a message to notify the new database created successfully or not. 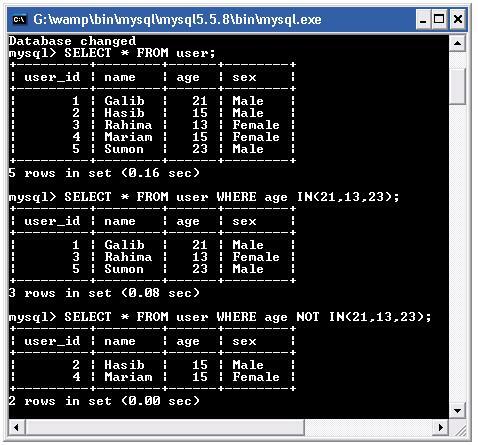 If you want to CREATE, INSERT, UPDATE, ALTER or DELETE a table, you need to select a database. Thus, you need to call the common use in order to use the database. 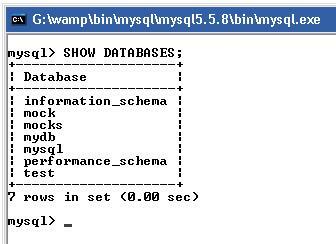 After executing the statement, MySQL will returns you a message to notify the new database dropped successfully or not. ISAM had been deprecated and removed from version 5.x. All of it functionality entire replace by MyISAM. ISAM table has a hard size 4GB and is not portable. 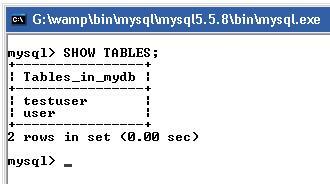 MyISAM table type is default when you create table. MyISAM table work very fast but not transaction-safe. 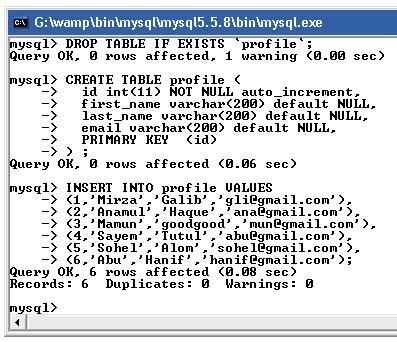 The size of MyISAM table depends on the operating system and the data file are portable from system to system. With MyISAM table type, you can have 64 keys per table and maximum key length of 1024 bytes. 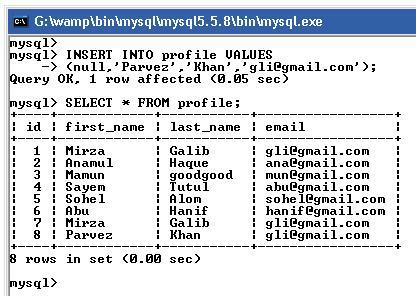 Different from MyISAM table type, InnoDB table are transaction safe and supports row-level locking. Foreign keys are supported in InnoDB tables. The data file of InnoDB table can be stored in more than one file so the size of table depends on the disk space. Like the MyISAM table type, data file of InnoDB is portable from system to system. The disadvantage of InnoDB in comparison with MyISAM is it take more disk space. BDB is similar to InnoDB in transaction safe. It supports page level locking but data file are not portable. 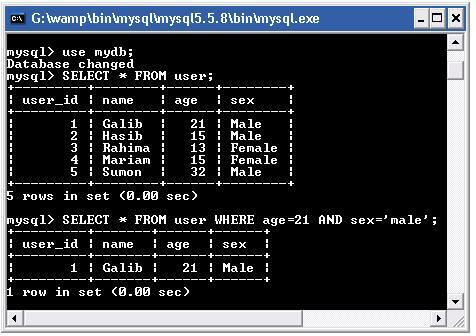 Merge table type is added to treat multiple MyISAM tables as a single table so it remove the size limitation from MyISAM tables. Heap table is stored in memory so it is the fastest one. Because of storage mechanism, the data will be lost when the power failure and sometime it can cause the server run out of memory. Heap tables do not support columns with AUTO_INCREMENT, BLOB and TEXT characteristics. What kind of value it can represent. The space values take up and whether the values are fixed-length or variable-length. The values of a data type can be indexed. How MySQL compare values of that data types. 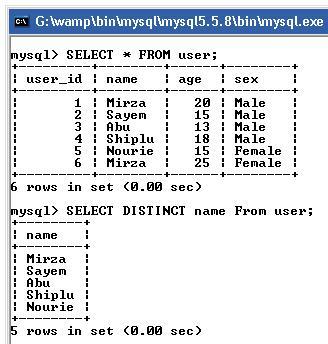 MySQL support many spatial data types as below table which contains various kind of geometrical and geographical values. 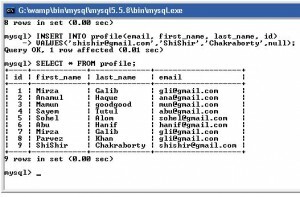 We can create a table in the database, and there are many ways to create a table. 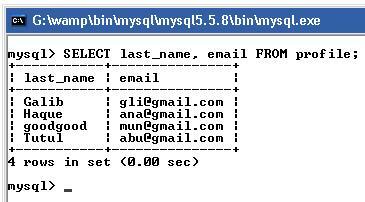 After executing the statement, MySQL will returns you a message to notify the new table successfully created or not. Drop table statement will delete the table permanently. You want to show the tables in the database. You use the SHOW TABLES. You need permission in order to insert data into a table. There are many ways you can insert data into a table. You can insert data from other tables or you can insert row by rows, or multiple rows. 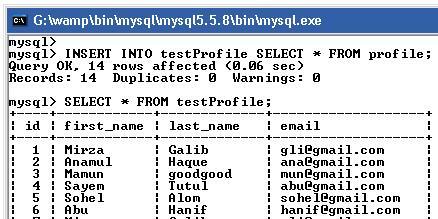 We insert data into the profile table, as we know the order of the columns, we don’t need to list it here, but it is not a good idea to do that. Usually, we need to list the columns to make sure that we insert data in the right order. We don’t need to specific the id column, because the id is auto increment and primary key, when we assign the null value to the auto increment column, it is automatically generated the unique id for us. We can list the column name in any order we want, but we need to make sure that the data that we insert into the table must follow the order that we have listed, else we will get an error or we insert the data wrongly. Insert multiple records, we must enclosed each record within parentheses and separated by commas. 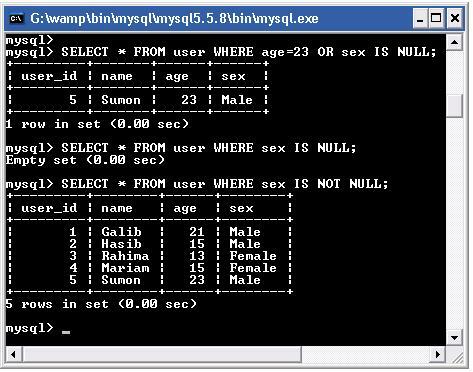 MySQL will automatically generated the key when you supply the insert value with the null/NULL. We get the return data from the SELECT statement from the profile table, and we filter the return data in the WHERE clause where the id is IN(1,4,6). 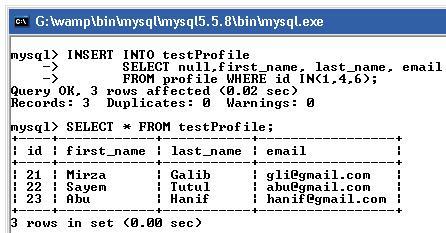 After that, we insert the return data from the SELECT statement into the testProfile table. We want to generate a new id in the testProfile table, so we need to assign the null value in the SELECT statement. 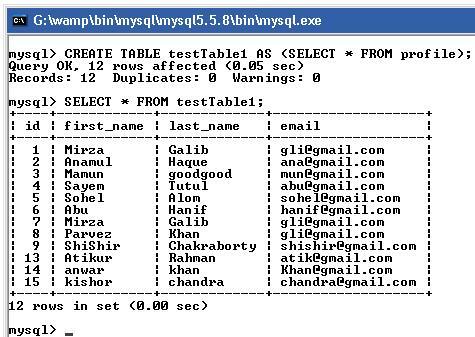 We create the testTable1 table from the user table. We create the testTable1 from the user table. All the records in the user table will be created in the testTable1. We use the describe to describe the table structure. Select statement is used to retrieve table data; you must provide the table name. 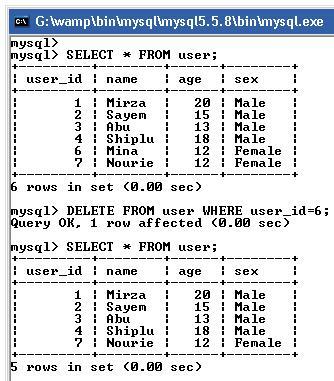 The select key word in MySQL is case insensitive, you can use SELECT or Select. It’s the same. 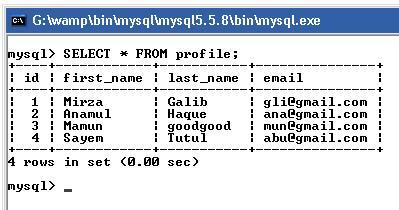 We use the SELECT Statement to query the data information. We need to filter the return data and we need to use the WHERE clause. WHERE clause uses to filter data according to the criteria. LIMIT keyword uses to return row specific by the total number of rows to return. 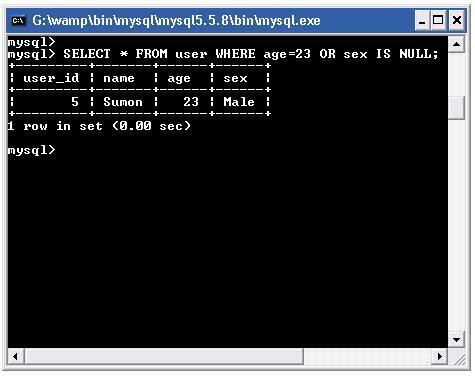 Tell MySQL to return only the unique values from the query. The Distinct keyword must place before a column name. The Distinct keyword will apply to all the columns. 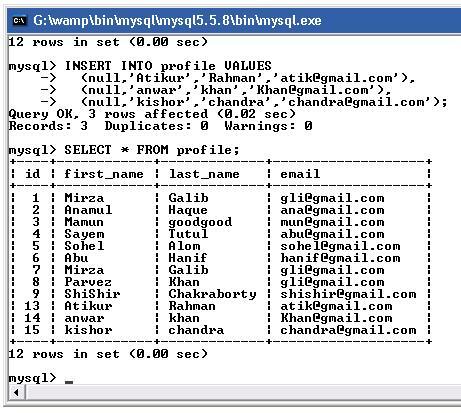 * Note: First query will return all the rows, and we can see that the user name Mirza is displayed twice. 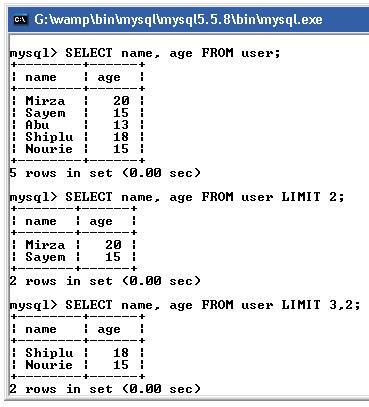 In the second query, we can see that the user Mirza is displayed only once. We need to update the record, and we need to use the UPDATE statement. Make sure that you have the WHERE Clause when you use the UPDATE statement. Without the WHERE Clause, you will tell MySQL to UPDATE all the records. We have inserted record into the table, and how do we remove a record from a table. In this tutorial, we will learn how to do that with the DELETE statement. Truncate uses to empty the whole table. All the records in the table will be deleted when you call this statement. The table user will be empty. We assume that we have inserted many records into the table. At the simplest level, delete scans the table and removes any rows that match the given criteria in the (optional) where clause. It generates rollback information so that the deletions can be undone should it be necessary. Index entries for the deleted rows are removed from the indexes. You must commit to make the deletions permanent. When deleting rows from a table, extents are not deallocated, so if there were 50 extents in the table before the deletion, there will still be 50 after the deletion. In addition the High Water Mark is not moved down, so it remains where it was before the deletion began. This means that any subsequent full table scans may (still) take a long time to complete – because a full table scan always scans up to the HWM. So, by example, if a select count(*) from very_large_table; took 15 minutes to complete before all the rows were deleted, you will find that it still takes about 15 mins after the deletion – because Oracle is still scanning every single block up to the HWM – even though some (or all) of the blocks may have no data in them. Truncate, on the other hand, simply moves the high water mark on the table right down to the beginning. It does this very quickly, and does not need to be committed. Once you truncate a table, there is no going back. Indexes are also truncated. There is no facility to be able to specify which rows to ‘delete’ as you can with the where clause on the delete command. When a table is truncated, all its extents are deallocated leaving only the extents specified when the table was originally created. So if the table was originally created with minextents 3, there will be 3 extents remaining when the tables is truncated. If you specify the reuse storage clause, then the extents are not deallocated. This saves time in the recursive SQL department if you intend to reload the table with data from an export for example, and can reduce the time it takes to do the import as there is no need to dynamically allocate any new extents. We use the keyword AS to label the columns name to a different name from its default name. We use AND operator to filter more than one column. It returns only rows that matching all the condition. The OR operator is opposite of the AND operator. The OR operator retrieves rows that match either condition. We use IS operator to check whether the value is null or not null. NULL is no value, and it is not mean it contains 0 or have an empty string or space. LIKE operator for filter the retrieve data and perform wildcard text searches.